Hey Orlando job seekers! The annual Disability Employment Expo is at the Orlando Fashion Square Mall on May 7, from 10 a.m. to 1 p.m. There will be presentations, mock interviews, and resume critiques. Walgreens, Cole Engineering, and Waldorf Astoria & Bonnet Creek Hotels are just a few of the employers that will be in attendance!! Check it out and possibly walk away with a job! Categories: Uncategorized | Tags: Agency for Persons with Disabilities, APD, Employment, Events, Florida, Jobs, Success Stories | Permalink. The December Champion is Here! APD Director Barbara Palmer gets into the Holiday spirit. APD customers and their families talk about the benefits that iBudget brings to their lives. More stories are shared about the success of Disability Mentoring Day activities all across Florida. Governor Scott makes appointments to the Area 15 Family Care Council. Tacachale prepares to welcome the Holidays with its annual Christmas Tree Lighting Ceremony. And a fraternity helps families in need. These and many more stories are in the December issue of The Champion—APD’s monthly newsletter. We hope you enjoy it! Categories: Uncategorized | Tags: Agency for Persons with Disabilities, APD, Disability Mentoring Day, Florida, Governor Scott, iBudget, News, Success Stories, Tacachale, The Champion | Permalink. MIAMI — Yaneris Alonso is a 25-year-old woman who dreams big and has the courage to make her dreams a reality. After facing a personal tragedy involving the loss of her mother and brother, Alonso decided to focus on her future and that of her young daughter. Within two years, the Miami woman obtained a GED and a vocational certificate, completed an internship and secured full-time employment in a Miami hospital. Alonso has a developmental disability and receives services from the Agency for Persons with Disabilities. October is National Disability Employment Awareness Month, when APD and other state agencies highlight Floridians with disabilities who are successfully employed in their communities. At the end of 2010, Alonso wanted to improve her life and spelled out her objectives very clearly. They included obtaining a GED, going to school and getting a job. With the assistance of Luis Blandon, her supported living coach who is funded by APD, Alonso enrolled in GED classes at Lindsey Hopkins Technical Education Center in Miami. The counselor there told her about other options and explained that Alonso was qualified to enter the dietary aid program, which would allow her to learn a trade quickly and build a foundation for the discipline necessary to study for the GED. Alonso considered this option carefully and decided to give it try. Alonso woke up early, went to classes every day, did her homework and studied very hard for her tests. She graduated in December 2011, completed an internship at Palm Springs General Hospital in Hialeah and earned her certificate in nutrition and dietetic services. 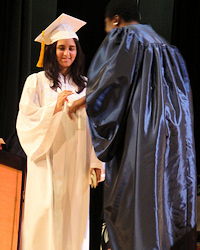 With certificate in hand, Alonso landed a job in the Food and Nutrition Department of the University of Miami Hospital. As a trayline worker, Alonso performs a variety of duties including preparing the food trays and serving meals to hospital patients. She enjoys taking the skills she acquired in school, putting them into practice and earning money for it. “My job makes me feel very proud that I am doing something good for me,” says Alonso. Her supervisor, Stefanie Thompson, says Alonso pays attention to details, always has a positive attitude at work and is very sociable and compassionate with the patients. Thompson says that Alonso excels at her duties and that hiring her was a good decision. APD supports people with developmental disabilities to live, learn and work in their communities. The agency annually serves more than 50,000 Floridians with autism, cerebral palsy, spina bifida, intellectual disabilities, Down syndrome and Prader-Willi syndrome. For more information about the Agency for Persons with Disabilities, visit APDcares.org or call toll-free 1-866-273-2273. Categories: Uncategorized | Tags: Agency for Persons with Disabilities, APD, Disability Employment Awareness Month, Employment, Jobs, October, Success Stories | Permalink. ST. PETERSBURG — Terry Baptist, 43, who is employed at Tradewinds Resort in St. Petersburg, had a specific goal in mind when he started his job in 2008. He wanted to get his driver’s license and purchase a car. Baptist has achieved those goals and many others in the last four years. He has worked diligently to improve his living environment, as well as his finances. Baptist, who has autism and other disabilities, receives services from Florida’s Agency for Persons with Disabilities. October is National Disability Employment Awareness Month, and APD is showcasing the workplace achievements of people with disabilities and celebrating the employers that hire them. 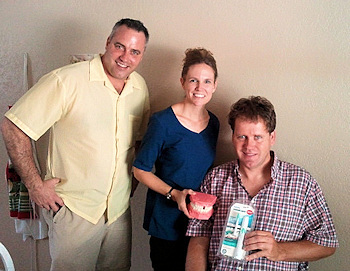 With the assistance of his live-in support provider, Deborah Evans, and supported living service provider, Chris Starke, Baptist was able to obtain intensive dental services donated by the University of Florida and the Special Day Foundation. UF dental hygienist Rachel Sabo visits Baptist on a monthly basis to make sure that he is maintaining proper dental hygiene. Through the guidance of his support team and his own drive towards independence, Baptist is learning to pay monthly bills and is well on the road to becoming more self-sufficient. “Terry is diligent at what he does and doesn’t stop until the job is done,” said chef Justin Harry at Tradewinds Resort. Baptist’s supervisor, Henry Harden, agrees. “Terry is very good at his job. He is focused and always on time. He’s just one of the regular guys,” Harden said. His long range goal is to purchase a home. “I don’t want to have to keep paying rent the rest of my life,” said Baptist. He also has a keen interest in environment sustainability and is always looking for ways to protect, recycle and reuse resources. In his free time, Baptist enjoys building model cars, playing video games, and watching documentaries and NASCAR races. APD supports people with developmental disabilities to live, learn and work in their communities. The agency annually serves more than 50,000 Floridians with the developmental disabilities of autism, cerebral palsy, Down syndrome, intellectual disabilities, spina bifida and Prader-Willi syndrome. To learn more about the agency, call 1-866-273-2273 or visit APDcares.org. APD ran a series of stories in our local paper, the Tallahassee Democrat, highlighting our clients who are successfully employed. We had so many Success Stories publish we didn’t have time to blog about them all before October ended! We only have three more stories that were published so I’ll go ahead and post them today. Enjoy! 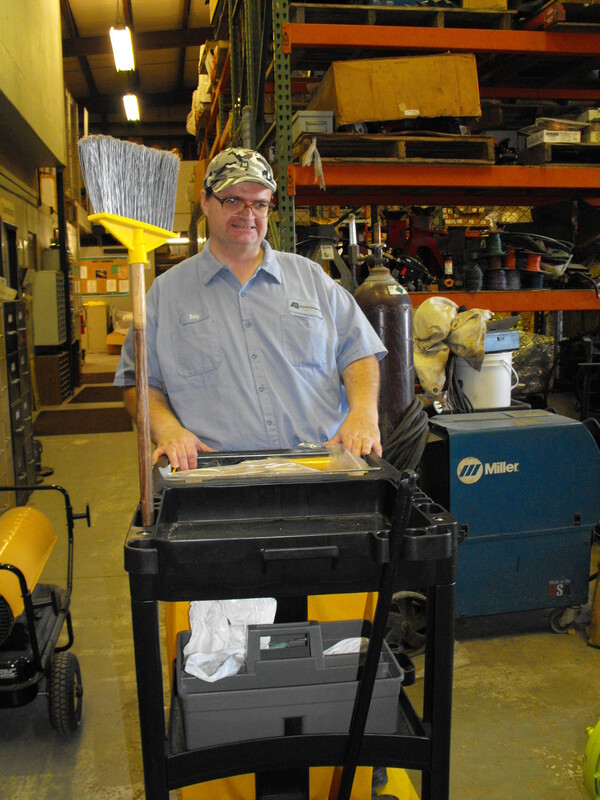 JACKSONVILLE — Bobby Higgins is truly dedicated to his maintenance and custodial job at Moran Environmental Recovery in Atlantic Beach. Higgins, 52, loves his job, which he has had for more than a year. “I am doing a good job. They like me. I keep it nice and clean, and it smells good,” he said. October is National Disability Employment Awareness Month. Florida’s Agency for Persons with Disabilities is highlighting the contributions of people with disabilities to the workforce. Higgins has a developmental disability and receives services funded by APD. He drives himself to work around 5 a.m. to get an early start on his responsibilities of cleaning, dusting, mopping, vacuuming and a variety of other duties. He fills a cooler with water bottles and ice for the work crews that are going out to work on environmental cleanup projects. “Bobby quickly became part of the MER family. He happily adjusted his schedule to make sure certain tasks are done early and don’t disturb us during regular working hours. He is always on time, diligent, hard-working and very thorough in all his assignments. He lets us know when we have to make repairs or order supplies. And Bobby is always polite, professional and just a pleasure to be around,” said Leslie Detlefsen, the firm’s manager of business development. Higgins lives with his sister and her husband in Jacksonville Beach. His passion outside of work is professional football. The tag on the front of his blue Dodge Dakota truck has a football on it along with “Bobby.” Higgins likes the Jacksonville Jaguars, however, he loves the Pittsburgh Steelers because he was born in Pennsylvania and lived there until 10 years ago. APD supports people with developmental disabilities to live, learn, and work in their communities. The agency annually serves more than 50,000 Floridians with autism, cerebral palsy, spina bifida, intellectual disabilities and Down syndrome. For more about the Agency for Persons with Disabilities, visit APDcares.org or call toll-free 1-866-273-2273.